This seminar studied the collecting and display of Greek and Roman objects from antiquity to the present. Students looked at current and past controversies about plunder and cultural patrimony. They also engaged in firsthand study of coins, vases, statues, portraits, frescoes, and mosaics and conducted advanced research on their original functions and contexts. Trips to museum collections offered opportunities to assess installations of ancient objects in modern settings. Assignment 1: Research an ancient object from the Museum’s Collection and write an Object Research Report. Assignment 2: Conceive an exhibition featuring the object you researched and write a rationale for that exhibition. Student Project Example: Roman Lar object research report by Taylor Anderson ‘15 and her Google Sketchup exhibition concept. "This seminar considered the collecting and display of Greek and Roman objects from antiquity to the present. During the first half of the semester we visited very different collections and spoke with curators about their installations (the Mount Holyoke College Art Museum, the Skinner Museum, the Mead Museum at Amherst, the Smith College Art Museum, and the Yale University Art Museum). 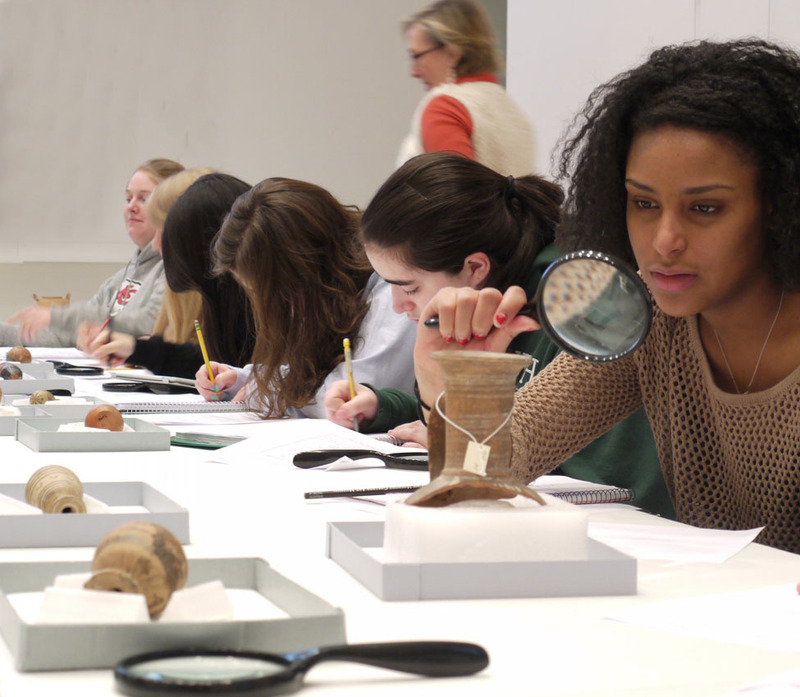 For the second half of the class, students each selected an ancient work of art with incomplete object records from MHCAM’s collection, and conducted extensive research about it, trying to retrace the object’s journey from its original cultural context to its eventual acquisition by a college museum in South Hadley. The culminating project for the course asked students to design an exhibition using their object as a touchstone for creating a narrative experience for museum visitors. Students integrated ideas about installation, historical context, cultural patrimony, aesthetics versus the function of objects, and other challenges related to the display of ancient objects that have been separated from their place of origin. Some students built three-dimensional object models, while others made virtual installations with UCurate or SketchUp software. All the students wrote papers explaining their exhibition goals, reasoning, and process."